Click on a game title to read the detailed step-by-step instruction guide! Air Balloons – Keep your balloon in the air for longer than the other teams! Animal Sounds – A simple game of making animal sounds and finding your pairs! Art Effects – A collaborative drawing activity. Bang Name Game – To avoid getting shot, learn and remember names of the people in a group! Bango – A card game similar to Bingo. The Bests – An icebreaker of silly competitions of who is the quickest, biggest, fastest! Best Skills Showdown – Compete in small groups in several mini-games! Beverage (Beer) Pong – A classic party game enjoyed by college students. Bigger and Better – The classic teambuilding game of trading and upgrading – try to get the biggest and best item to win! Botticelli – A guessing game similar to 20 Questions. Blanket Game – A funny icebreaker that involves fast name recognition! Candy Introductions – A fun game that uses multicolored candy to help people get to know each other. Catch the Ball – A simple game to get people to start talking and sharing. Categories (or Similarities) – Be the first group to find similarities! Chariot Race – An action packed chariot race! Collaborative Drawing – Draw parts of a picture without knowing what the last person drew before you! Connecting Stories – Group members try to connect their individual stories, forming a long chain of stories! Crazy Job Interview – Players convince each other that they are the best for an imaginary job. Defend the Egg – A teambuilding activity that asks teams to protect a fragile egg by building a protective stucture out of simple supplies. Did You Know? Bingo – An interactive game that helps people discover interesting facts about other people. Drink Can Games – Try these fun games that involve beverage cans. Electric Current Game – A game with two teams, holding hands: squeeze hands to send “electricity” down the line! Energy Game – A drama class warm-up exercise that is great fun! Extreme Rock, Paper, Scissors – A twist on the classic Rock, Paper, Scissors game. Extremes: Where Do You Stand? – A game that asks people to stand along an imaginary line between two extreme viewpoints, depending on their opinions. Fabulous Flags – Represent yourself by designing your own flag! Fake Artist – Everyone draws a single line in a shared drawing — but who is the secret spy? Fear in a Hat – A teambuilding activity that asks people to anonymously share their fears and to place them into a hat. Four Corners – A get-to-know-you game involving the four corners of a room. Frozen T-Shirt Race – A hilarious contest of being the first to unfold and wear a frozen shirt. Ghost Game – A game that involves forming a word fragment without spelling a word! Giants, Wizards, Elves – A game similar to paper, rock, scissors, but more hilarious! Gone Fishin’ – A funny real-life version of the board game! Great Wind Blows – A game like musical chairs that lets people get to know each other better. Group Juggling – Say a person’s name and then pass them a ball. This repeats as people learn each others’ names. Hot Potato Camera – Like Russian Roulette, but as an embarrassing selfie photo! Human Paper Rock Scissors – Like the classic game — except played in groups with your whole body! Hot and Cold Game – A simple game of cheering or booing when a person gets closer or farther from a mystery action! 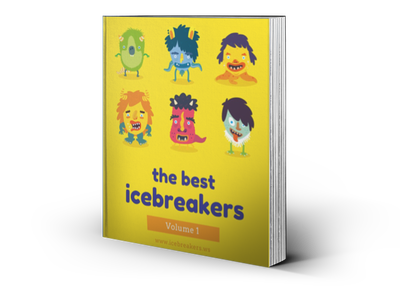 Icebreaker Questions – A list of simple questions that are very useful for breaking the ice. Icebreaker Questions 2 – Even more icebreaker questions to help people get to know each other better. Identity Circles – Share your most important values as you rotate around a circle. Interview Game – People interview each other and introduce them to the rest of the group. Intimate Cooperation Games – Try these 3 games that involve intimate cooperation. ISpy Wedding Hunt – A photo scavenger hunt for wedding receptions. King Elephant – A silly action game that involves hand motions and acting as animals. Korean Rhythm Game (Assa) – A game involving hand motions. Late Arrivals Game – A funny game that involves introducing fictitious people at a formal ball. Line Up Game – Work together as a team to quickly form a line based on a non-obvious quality. Lost on a Deserted Island – If you were stranded on a island, what items would you take with you? A get-to-know-you game. Magic Word – A simple party game involving a magic word to earn party favors. Marshmallow Toss – Toss marshmallows and catch as many as possible. Memorable Catchy Names – A very simple icebreaker involving adjectives and new names. Name Aerobics – A simple game that combines aerobics and learning names! Never Have I Ever – A game to see who has and hasn’t had various experiences! Newspaper Towers – A teambuilding activity involving newspaper building skills and teamwork! Paper Airplanes/Name Planes – A simple introductions game involving questions on paper planes. Paper Snowball Fight – A paper-based snowball fight! Pedometer Games – Try these games that involve pedometers! Personal Artifact Game – Students show a meaningful object and why it has significance to them. Personal Trivia Baseball – A fun trivia game that combines baseball with a way to learn interesting facts about people. Photo Scavenger Hunt – An active teambuilding game that sends teams off to take photos of interesting things in a scavenger hunt! Physical Party Games – Three silly party games. Priest of the Parish – A call and response game. Psychiatrist Game – Everyone has a strange mental condition. The psychiatrist must guess the pattern that everyone else is following! React and Act Game – A fast-paced game of improv acting! Rubber Chicken Game – A race involving stealing a rubber chicken. Sardines – The classic game of reverse hide-and-go-seek. Screaming Viking – A silly game involving crazy motions. Secret Santa – A gift exchange game perfect for the holidays. Sequence – A teambuilding game of communication and ordering pictures. Shoe Pile Mingle – The (slightly smelly) game of meeting new people. Song Sync – A game of determining what songs others have already listened to. Sorts and Mingle – A fun way to see the similarities and differences people have. Spoons Game – Spoons is a game of speed, silliness, and having a sharp eye. Sticker Ninja – Stealthily stick your stickers on others at a party! Story Starters – A simple activity to help people share some of their most interesting stories. Strange Disease Diagnosis Game – A funny improvisation guessing game with doctor and patient(s). String Game – An icebreaker that makes use of string or yarn to help people introduce themselves. Superlative Game – The fun game of superlatives! Tall Tales Story Game – A fun storytelling game. Team Architect – Use creativity to build something with random materials! Telephone Charades – A hilarious twist on the classic game of telephone, involving charades and acting down the line! Telephone Pictionary – The Telephone Game meets Pictionary, leading to hilarious results! Tilt A Cup – Balance a swinging tower of cups and balls. 1000 Blank White Cards – Create rules on blank white cards – a game of creativity! Time Hop – A get-to-know-you game from different points of time. Trust Course Game – A teambuilding game that involves coordination and trust. Trust Walk Teambuilding Activity – The classic teambuilding activity that requires trust and reliance on teammates. Truth or Dare – The classic party game that leads to memorable results. Two Truths and a Lie – As people introduce themselves, figure out which statement is true and which one is a lie! Ultimate Ninja – A game of quick reflexes — may the best ninja survive! Unique and Shared – An icebreaker that helps people see their commonalities and unique characteristics compared with others. What I Would Have Done – A get-to-know-you icebreaker involving interesting, hypothetical questions. Who Am I? – A simple mingling game in which you try to identify the name on your back. Who Done It? – A game in which you try to identity who did it! Who’s My Match? – Figure out each other’s hidden identities, and find your match! Word Associations – A simple game of making connections between words. Word Chains – A simple memory game involving word connections! Zip Zap Boing – A simple rhythm game. Catch the Ball Introductions Icebreakers,Ideas, Games, Activities! Art Effects - Icebreakers,Ideas, Games, Activities!